A home for food lovers with an open market atmosphere. Giant Eagle, Inc. has grown to be the number one supermarket retailer in Western Pennsylvania, Ohio, West Virginia and Maryland. 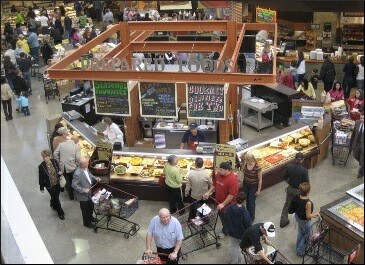 The Market District concept is geared to be a one stop shop for the food lover. In addition to the typical, everyday food items and services; the Robinson Market District store boasts an Open Food Court, Hydroponic Garden, Candy Shop, Coffee & Juice Bar, and even a Culinary School open for public enrollment. This is the 3rd and most recent Market District store that PFDI has had the pleasure of being involved with. Areas designed and detailed by PFDI include the Asian Food Cart Fare, Tossed to Order Salads, Smoke & Fire, Rosti & Crepe Bars, Pizza Station, Coffee & Juice Bar, Bakery, and the Central Kitchen. © 2005 Professional Foodservice Design, Inc. All rights reserved.